Does your company need a high quality Table Top Conveyor to make your production line more efficient? Trust the packaging line equipment experts at Volumetric Technologies for your conveyor table and filling line equipment needs. Our versatile table top chain conveyors have a modular construction and are easy to integrate into existing machines. They can adapt to any type of production line. If you need a reliable and sturdy table top chain conveyor for transporting goods from one end of the production line to another, we are the ones to call. 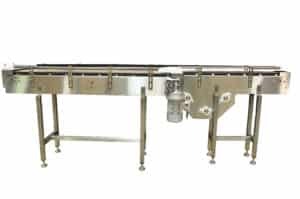 Our quality-built stainless-steel Table Top Chain Conveyors are available in standard open top, closed top, and hygienic designs. We made them applicable to lines for use with all types of filling and packaging machines to convey goods to and from various manufacturing lines. They can withstand heat and cold and are built to last in high-speed manufacturing environments. Also, all Food Grade Conveyors produced by Volumetric Technologies are smartly designed with easy wash down in mind, with several optional features to fit a variety of needs. Your workers will be able to maintain the cleanliness of your production area with ease. Along with our durable Conveyors, Volumetric Technologies also designs and manufactures Gap Transfer conveyors, and Rotary Unscrambling and Rotary Accumulation Tables for product processing lines. Through these solutions, you can reduce, if not eliminate, unnecessary pauses and breaks in your product processing line. Expect longevity for your operations, too. Volumetric Technologies is honored to collaborate with companies from diverse industries. No matter what product or service you offer, if you need conveyance equipment and accessories, we can be of service. Our table top conveyor makes product lines faster and more efficient. In lines where speed is not the priority, our range of conveyance equipment ensures a systematic, timely, and secure handling of raw and finished materials. Your products will come out in excellent condition because you reduce opportunities for mishandling and damage. Additionally, our conveyor belt tables may be controlled manually or integrated into an automated product handling system. As a result, they can be of value to every stage of your production line. From automated filling lines, to general product handling, to rotary accumulation and unscrambling tables, Volumetric Technologies can fulfill your conveyor needs. If you belong to any of these industries, or if your product line is in dire need of an upgrade and you’re ready to increase efficiency and consistency in your operations get in touch with Volumetric Technologies. Our engineers will be happy to help you out.